What happens when existence closes in and we become prisoners in our own city, desperately attempting to escape across a now-treacherous river that was not long ago a benign scenic attraction? A Connections Festival performance, Phoebe Éclair-Powell’s These Bridges presents a tale of disaster in London as the Thames’ banks overflow, passengers on the Circle Line are drowned, London is apocalyptically flooded and north is cut off from south. England’s beloved capital has now become a confined, encapsulated environment, unreal like The Truman Show, and like the latter ruled by myth and dominated by a desire to escape. Here four groups of teens attempt to cross the dangerous waterway because they want to find out if the other side is really better. The young crusaders’ bravery contrasts with their penchant for technology and an obsession with wifi, a coexistence amid a theme of duality that permeates the piece: duality of north and south, of safety and adventure, of material comfort and dissatisfaction with the superficial, of fear and a yearning for a more relevant future. The moral of the story is clearly one of achieving higher values as well as honouring mutual cooperation and bonding – sending the message that the way to courage and a better world is to work together. Although not written about Brexit, the work highlights the danger of the divisions it creates and is very apropos to our time. 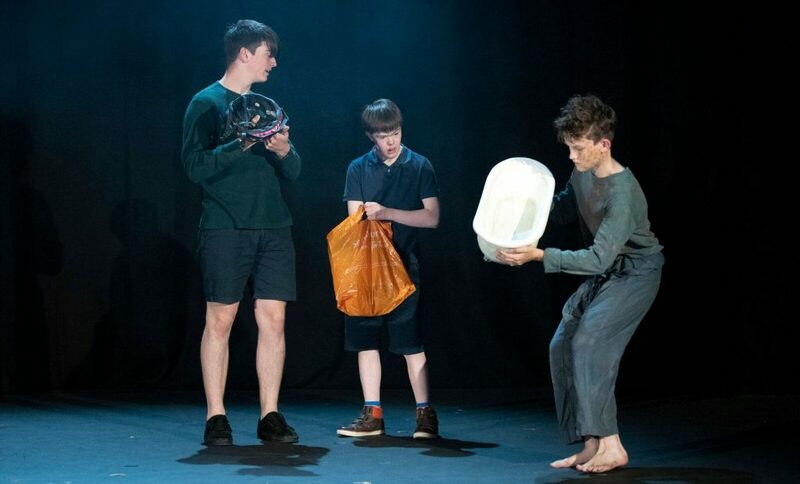 Performed by the Chichester Festival Youth Theatre, the acting of this young troupe is impressive. Eclair-Powell’s writing is characteristically astute and moving and the direction unobtrusively proficient. Minimal in terms of set, the compelling production effectively focuses on the emotions of the players. The play’s brief runtime provides a vignette, like a short story, but containing a powerfully condensed maelstrom of thought-provoking ideas about the human condition. Despite its gloomy subject, These Bridges offers a strong message of hope.